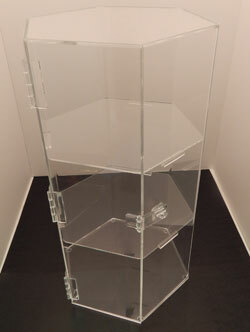 This is a tall jewelry display case constructed of clear acrylic plastic. The clear acrylic construction allows for your customers to easily view the items that you have on display. The clear construction makes this jewelry display case easy to fit into your pre-existing décor. There is a locking mechanism to ensure that your displayed merchandise is not tampered with. We use only the highest quality acrylic materials to construct our jewelry display cases to ensure durability. If you need a small acrylic display with lazy suzan capabilities, this display case will help your customer see your products from all sides. Acrylic will keep your products secure and attractive.